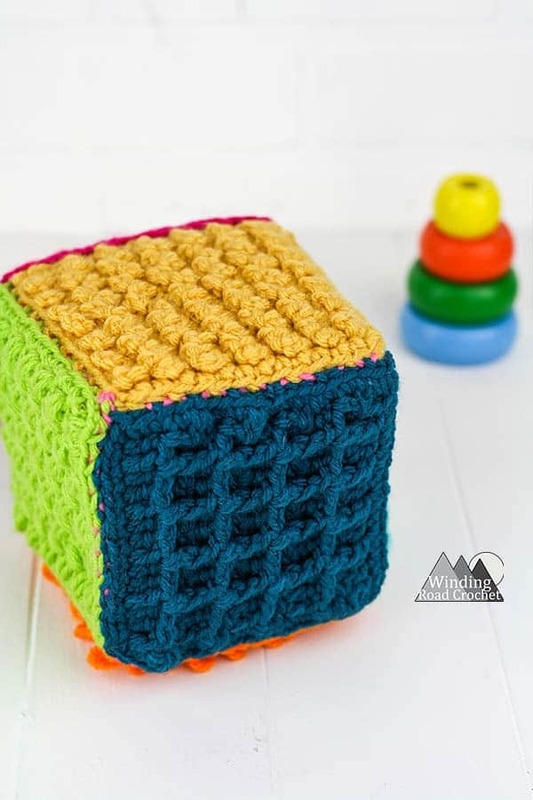 Crocheting for babies is one of my favorite things to do and the Crochet Sensory Block makes a great quick project for a baby shower. Just grab some colorful left over yarn from your stash and follow the tutorial below to make these sensory blocks. The Crochet Sensory Block is a final project from the March Texture Madness Crochet A Long. During the Crochet A Long we learned 9 crochet stitches and had the chance to make small, medium or large sample swatches. The Medium sample swatches we turned into the Crochet Baby Sensory Book, and the small sample sizes are used to create this block. Come back in a week to see what we do with the large sample swatches or sign up for the newsletter so you never miss a new free pattern. Don’t forget to use the buttons below to save this tutorial to Pinterst or Ravlery! Below you will find links to all the crochet stitch tutorials that are used to make the sides of the block. Each tutorial post has a video tutorial as well as the written pattern for the sample swatches. For the blocks you will need to make the small sample swatches. This block uses the small sample swatches made during the March Texture Madness Crochet A Long. Refer to those Tutorials for Stitches and Abbreviations. All posts linked below. Use the patterns for the small sample sizes in the links below to create a total of 6 block sides. You can make each side a different stitch, or make every side the same stitch. It is completely up to you. Before sewing the blocks together it is a good idea to block each side so that it is approximately 4.5″x 4.5″. Line four blocks up next to each other with the texture side down. Sew the blocks together using a invisible stitch or whip stitch. If you are unfamiliar with sewing crochet pieces together check out this video tutorial. Be aware that the number of stitches around the edge of each square may not be exactly the same, simply sew them together by lining up the top and bottom of each block and do not try to line up the stitches. Once you have a row of four sewn together, you will sew the first square to the last, being careful not to twist the row. Next, sew a square to the four squares closing up one end of you block. If you are using the plastic canvas, insert one piece of canvas into the cube. You will use one piece of canvas on each side. I used the plastic canvas because it made the sides straighter and will increase the ability to stack this block with other blocks. Why stop at just one block? Stuff the center of the block with polyfil or another filler. Add the top plastic canvas, if using it and sew the last block to the top. If using the plastic canvas you will have to stretch the sides of the block a bit, but this will keep your sides straighter. Once all the sides are sewn on, you will just need to weave in your ends and you block is complete. Make a few more and this will make a wonderful baby shower gift. Are you going to make a Crochet Sensory Block? I would really like to see your finished piece, take a picture and share it with me on any social media! Just tag me @windingroadcrochet, #windingroadcrochet, or #ourcrochetjourney. Join my Facebook Group and share your creation with the community at Our Crochet Journey Facebook Group! Written pattern, tutorials, graphs and pdfs of the Crochet Sensory Block are copyright Windingroadcrochet.com. Please do not reprint or repost this content as your own, but please feel free to share this link with others. You can find more information on sharing my work with others in the Terms and Conditions Page. Thank you so much for these! These are so awesome for babies, blind, autistic just amazes me how these will help so many of any age!